Greenleaf Book Group Press, 9781626343474, 48pp. Set long ago in the heart of the African savanna, Dream Big--a mythological fable--follows moody Baboon as he discovers a powerful secret. One by one, Caterpillar, Tadpole, and Flamingo gaze up at the night sky and wish upon a star for their wildest dreams. Baboon insists these dreams could never come true. But when he sees Caterpillar turn into a winged butterfly, Tadpole into a dancing frog, and Flamingo into a beautiful pink bird, Baboon realizes that a transformative power exists between the stars and the animals once they truly believe in themselves and their dreams. When Baboon tries out this secret, CATCH-M, his Magical, Mystical, Wished-Upon Star, whooshes down from the heavens to wham ignite the courage in his chest. Read on to see if his dream comes true too . 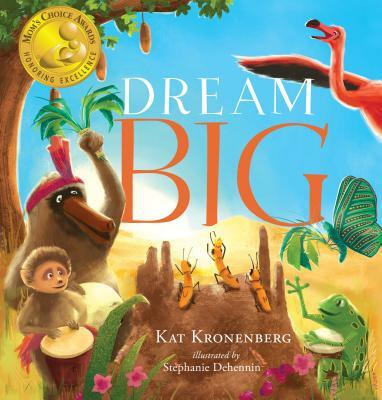 . .
Kat Kronenberg is a born-and-raised Texan with a Big Dream--that Two-Leggers--people--all around the world catch CATCH-M too, watch their wildest dreams come true, and live out the motto: ''Believe YOU CAN! Smile. Be you. And jump for joy as you do!'' Kat lives in Austin with her husband and is the proud parent of two amazing boys, two beautiful adopted nieces, four fantastic grandchildren, and three four-legged friends.